Excerpt: In the 10 years that I have been editor of The Microscope journal, I can only count on one hand the number of times we have received a nasty letter from our readers, or anyone else, complaining about the content of our publication. Thanks to the expert authors, top-notch articles and our capable editorial staff, the structure and style of this journal is apparently mostly unremarkable. If you’re hoping that I will tell you about a nasty letter we just received, you will be disappointed. There haven’t been any. Excerpt: Death may appear as an instantaneous ending, but looking into the microscope reveals that life often persists long after we think people have died. Abstract: Affordable microscopes are currently produced as teaching tools and as low-end laboratory instruments for inspection of manufactured parts. The trend of integrating digital imaging electronics with low-cost optics is also prevalent because of the economies of scale and the availability of software tools to capture and enhance high-resolution images. 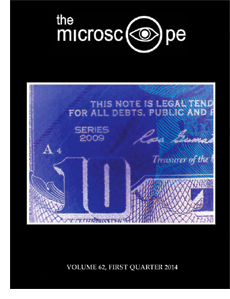 This article reviews the MiView200UM USB microscope as a laboratory tool used to examine paper currency and coinage and discusses the hardware features, software interface and several shortcomings of low-cost imaging. Abstract: The use of X-ray tomography to study food dates back to the 1990s. Fruits, such as apples and peaches, were studied to determine water content and internal changes with time. The fat deposition in pork and measurements of breast meat in broiler chickens have been investigate with X-ray tomography. The initial work used medical CT scanners. As equipment was refined for non-medical uses, the focus of the X-ray tomography studies moved from macro features to micro features. Ice crystals that formed during freezing have been studied, and a cake’s microstructure was correlated to textural properties. The key feature to X-ray tomography is that it is a technique that allows the interiors of an object to be three-dimensionally imaged based on density or atomic number differences. If the sample can fit within the imaging area, the sample can be imaged without having to physically alter the object, i.e. it is non-destructive. In order to achieve three-dimensional images, multiple two dimensional X-ray images are taken of the object and then are computer reconstructed into a three-dimensional depiction. The image quality determines the ability to visualize individual domains within the sample and the ability to quantify these domains. This article will discuss optimizing data collection parameters to improve the resolution for differentiation of domains and three-dimensional image quality. Excerpt: NT-MDT, a global provider of innovative atomic force microscopes (AFM) and scanning tunneling microscopes (SPM), announces Titanium, the first AFM with a self-aligning, multiple probe cartridge that features fast, automated tip exchange. Originally published in The Microscope, Vol. 32, No. 3, 1984. Abstract: In the chemical analysis of food, evidence concerning the physical state of constituents is destroyed. By using non-destructive techniques the food microscopist can provide this information but, to do this, methods appropriate for the material being examined must be chosen. Techniques involving minimum disruption of food structure include methods of optical contrast, vapor staining and the use of a stain-mountant. That processed foods are susceptible to artifacts is illustrated by a comparison of the results obtained by solution and vapor staining of starch and lipid present in a commercial food emulsion. The use of a toluidine blue stain-mountant provides a rapid method for detecting plant tissue in this and similar food products.